The year is 1878. 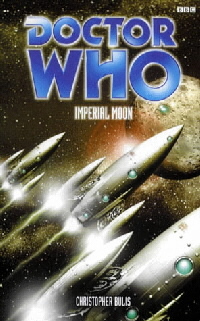 Three ships of the British Imperial Spacefleet have just set course for the moon. The discovery of a mysterious diary, recalling a seemingly impossible journey, takes the Doctor and his companions back to a crucial moment in history - and into certain danger. For the moon of 1878 is far from deserted. Trapped in a crater teeming with hostile animal and plant life, the Doctor and Turlough must join the British explorers on a hazardous journey to battle for their freedom before the long lunar night descends. For, lurking in the shadows are the Vrall - cunning and utterly ruthless killers. With the loss of one of their ships - and their captain - the British team become embroiled in a struggle to survive that tests duty and honour to their limits. Meanwhile, Turlough finds himself with Time in his hands and the Doctor must make a choice that will determine the future of an Empire - and Earth itself. Featuring the Fifth Doctor, Turlough and Kamelion, this story takes place between Resurrection of the Daleks and Planet of Fire.